Copper is a Nova Scotia Duck Tolling Retriever. 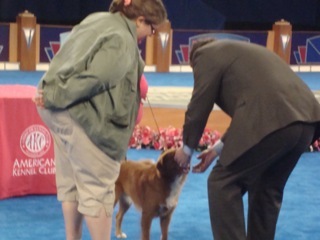 And last December, I got to "show" him at the American Kennel Club Championship Blogger Stakes in Orlando, presented by Eukanuba. It wasn't a real competition, just a chance to see what it's like to be in that ring. And I can tell you, it was a bit fierce. First, let me say that Copper is an awesome dog. He was fun, and very friendly. He's also a champion dog, though he hadn't been in that ring before. His owner said some people spend their whole lives trying to get into the big ring! You come into the ring and walk around it to get into position. You have to keep the leather lead tight and high, so the dog trots exactly next to you (something I had a lot of trouble doing with Copper.). You even have to wrap the lead around your hand a certain way. You wait for your turn. Then you do to the judge, who has to check the dog all over. The judge is also constantly watching the way the dog is "stacked," the way he stands. And he watches the way the dog walks with you. You walk from the judge to a spot diagonally from the judge, and back.This way the judge can check the way he walks. It's not just about the way you show the dog, but about the dog himself and whether he is up to standards. AND, is the tail up? An up tail means a happy doggy. The tail needs to be up. This was my first time, and obviously not my dog, so it made me a little nervous. I did not "win" the Blogger Stakes. But it gave me a bit of insight into what it takes to show a dog in the big ring where AKC champions and grand champions strut their stuff. Wow that sounds exciting. I can't wait to hear the rest of the story. That must have been amazing to run the blue carpet.